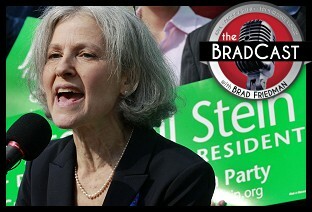 " 'We're Seeing the Dean Scream of 2016,' Says Green Party Presidential Candidate Jill Stein: 'BradCast' 5/19/2016	"
In our wide-ranging conversation, Stein offers her case for why voters in both CA and around the country should vote Green this year, explains what she sees as the problem with the Democratic Party (as well as the Republican and Libertarian Parties), offers details on her recent invitation to Bernie Sanders to join forces, given what she describes as a "smear campaign" being run against him by the DNC, and responds to questions about being a "spoiler" in both the CA primary, as well as the November General Election. "The guys running the show in the Democratic Party are basically the funders --- and that's predatory banks, fossil fuel giants, war profiteers, and insurance companies," Stein tells me. "With the Democratic Party you see basically a 'fake left-go right' situation, where they allow principled, inspired campaigns to stand up and be seen, but they sabotage them when push comes to shove. That, unfortunately, is what we see go on right now with the Sanders campaign, which is making a valiant effort here to do the right thing and change the party." Alluding to the moment when media used a rallying cry from 2004 Democratic Presidential candidate Howard Dean in order to undermine his campaign, Stein charges a similar "smear campaign" is now being run against Sanders by the Democratic establishment in the wake of last weekend's raucus Nevada state Democratic Convention in Las Vegas. "I think what we're seeing now is the Dean Scream of 2016," she says. "This is the sabotage of the Sanders' campaign, being conducted by the Democrats." Stein also responds to my questions about why, after arguing for a more inclusive (small "d") democratic process, her own Green Party will be holding a closed primary --- open to affiliated party members only --- in CA on June 7th, as well as on the charge that she might serve as a "spoiler" this November. "This politics of fear that tells you you have to vote against what you're afraid of, instead of for what you believe in --- the politics of fear has a track record. It has delivered everything we were afraid of. All of the things you were told you had to bite your tongue and let the 'lesser evil' speak for you --- we've gotten all those things, by the droves. The expanding wars, the meltdown of the climate, the offshoring of our jobs, the attack on immigrants. We've gotten all of that." Stein says. "Not that there aren't some differences between the two parties, but they're not enough to save your life, to save your job, or to save your planet. This is a race to the bottom between the two sold-out corporate parties." Okay. But if a vote for her might actually result in a President Donald Trump, does she really believe it's smarter to vote Green this Fall? Tune in for her answer. And speaking of that "smear campaign" against Sanders that has, indeed, followed last Saturday's Democratic state convention in Nevada, with repeated charges made by media and top party officials, such as DNC Chair Debbie Wasserman Schultz, that there was "violence" at the event by Sanders supporters, we join NPR in doing a bit of fact-checking on the evidence said to support those very serious allegations. « PREVIOUS STORY "'Green News Report' - May 19, 2016"
"'We're Seeing the Dean Scream of 2016,' Says Green Party Presidential Candidate Jill Stein: 'BradCast' 5/19/2016"
Excellent and much needed interview, Brad. It ties in with an article published earlier this year by The Hill the "two party system is destroying America." so my question is, how did pike's zeroing out reflect the exact final result of pike if indeed it was not counted yet? If you'd be so kind to reply to my comment in the same thread where I replied to your initial comment, it would be greatly appreciated, so we can keep the conversation in the same place so its easier to follow. If you repost the above back on the original thread, while I look into what you're referring to, it'd be appreciated, and I'll reply on that same thread. Thanks! Oh dear, it looks like there IS a video of chairs being thrown at the Nevada convention. This must be the one Debbie Wasserman saw. I have reposted your comment for you on the original thread back here, and I have replied to it there as well. Thanks. The corrections about Nevada convention violence from both NPR and Snopes were, shall we say underwhelming. In spite of the fact that neither were able to find any documentary evidence of "violence" or "chair throwing" or even credible testimony from attendees, both sites continued to use this discredited language even as they were supposedly debunking it, leaving any readers with a "where theres smoke..." final impression. The DNC and the entire corporate media are nothing but bald faced liars. Clinton is stealing the primary, according to exit polls most likely has stolen delegates in 13 to 15 states and without any question will do so in California. So she can not even win the primary with mostly just democrats voting, Independents loathe her so she would be lucky to get 30% of the Independent vote. At least 30+% of the democratic base will NOT vote for her under any circumstances. This makes her 100% Unelectable even against a total Buffon like Trump. If she steals the primary she will lose the general by double digits, won't even be close. I hope Bernie joins with Jill Stein, I bet they could win. While I would not discourage anyone who desires to vote for a Green Party candidate, one should do so recognizing that with or without Bernie Sanders added to the ticket, a Green Party candidate has no chance of prevailing. It is a matter of simple math. As of 2015, the Green Party had ballot access in only 20 states. The number has since grown to 21. Here in California, where a Republican has no chance of winning, one can easily vote their conscience. But it is difficult to argue with Noam Chomsky's assessment that those living in swing states should vote for Clinton because "today's Republican Party [is] the most dangerous organization in human history." For what it's worth, while Exit Polls can be a red/yellow flag for potential fraud or vote tabulation error, I am far less than convinced by the evidence that has been made available to date in favor of the argument you offer above. Nobody outside of the corporate media has seen the raw data from the Exit Polls. The numbers that Charnin and others are describing as "unadjusted" is, in fact, already "adjusted", so it's my belief (again, FWIW), that there is reason to be skeptical of results --- as ever, for reasons I've documented here for more than a decade --- but no particularly compelling "proof" or greater evidence than in other elections that "Clinton is stealing the primary". I'm no particular fan of Clinton, but, as you hopefully know by now, I call this stuff as a I see it, without fear or favor. For the record, as I noted on Friday's show, the exact same number (28%) of Clinton supporters, around this time in 2008, also said they would not vote for Obama if she Clinton failed to become the nominee. Worse, in fact, they said they planned to vote for McCain in that case. How it eventually go in 2008? Ask President McCain, I guess. Brad: I question whether Charnin's numbers are "adjusted." Adjustments take place after the count comes in. The ostensible purpose is to see that the exit polls conform to the official count. My view, albeit somewhat cynical, is that "adjustments" are intended to conceal the gap between exit polls and the official count. Pollsters never "adjust" their exit polls to conform to the official count in foreign elections. Charnin relies on screen shots of exit polls that appear before the official count is recorded or reported. That is what he means by "unadjusted" exit poll totals. Unless the screen shots are contrived totals, and I've seen no evidence of that, there should be no difference between the initial exit poll results and the raw data. "I think what we're seeing now is the Dean Scream of 2016," she says. The false "balance" or "objectivity" or "neutrality" of the self-styled "mainstream" press are euphemisms for cowardice and self-interest. In 2004, when Governor Howard Dean was a candidate, the self-styled "mainstream" press said that he fell behind in the battle for the Democratic nomination because of the so-called "scream," as the "journalists" labelled his enthusiasm, at an event with his supporters. But it was later pointed out to me that the real reason for the "journalists" turning on him was that months before he had said that a handful of companies controlling the flow of information was a danger to the Republic. I believe the exact moment the media bosses decided to destroy Howard Dean came exactly one month before the "Dean Scream", on the Chris Mathews show. Dean: Yes, we're going to break up giant media enterprises. That doesn't mean we're going to break up all of GE. What we're going to say is that media enterprises can't be as big as they are today...To the extent of even having two or three or four outlets in a single community, that kind of information control is not compatible with democracy. I also believe somebody made sure Dean was talking through a sound isolating microphone that night. I saw an earlier event at a democratic candidate event held in a large hall, hosted by Hillary Clinton on C-Span, where Dean was doing his usual, rousing "You Have The Power" chant, and you literally, could barely hear the audience. Sound isolating microphone or no; all I saw that night was a great leader giving an exemplary pep talk to his hard working supporters. I still believe Dean would be a fantastic president. If I were benevolent dictator of the world, voters would be able to rank their choices for president on their general election ballot, rather than being forced to simply list one and only one candidate. If no candidate got a majority of the vote and my first choice had the fewest votes, my candidate would be eliminated and my ballot would then be awarded to my second choice. So I could vote, for example, for the Green Party candidate as my first choice and the Democrat I'm not so excited about as my second choice and my ballot would never, ever help the Republican to win the race. Too bad Brad has been fighting against this voting system, known as ranked-choice voting or instant-runoff voting since he was knee high to a grasshopper. Too bad one determined third-party candidate (whether Bernie Sanders or the Green Party nominee) may make the entire general election meaningless, as in the minute he or she gets in, the rest is fait accompli. Brad's a good guy. But this blind spot of his is coming home to roost. And I've argued with him for too many years to believe he'll ever admit that he's just wrong on this one. Still, some of you should give him a nudge. You never know, you might be the one to finally get him to admit that the current system of first-past-the-post voting is about as bad as it gets and not worthy of the country that is supposed to be the greatest democracy in the history of the world. P.S. When a third-party candidate tells you that they aren't a spoiler, you can give that as much credence as their claim that they have a chance of winning in the general. Ross Perot was a spoiler. Ralph Nader was a spoiler. And so for 16 straight years, we were governed by candidates who were opposed by a majority of the voters who participated in the determinative elections. November could be the beginning of yet another 8 years of such misgovernance due to election laws that simply can't handle three candidates in the race at the same time. Actually, I was wrong on that one, back when I supported RCV or IRV (for a few short minutes in 2004/2005), until I learned better, realized it requires computers for tabulation, saw it in practice, saw candidates (and voters) who couldn't understand the math of why they'd won or lost their own elections, and saw jurisdictions dump IRV almost as soon as they'd adopted it. ...and here I thought I'd been exceedingly generous by agreeing not to RCV or IRV, but to compromising with Approval Voting, which also avoids "first-past-the-post" type plurality winners, but is understandable, overseeable, and doesn't require computers for tabulation. And, the thanks I get for it? More grief from Mike about my incredibly reasonable and thoughtful position, even as he clings, without compromise, to his. I met Mike at a showing we put on here of "Uncounted" in 2008. We even had Bruce Funk as a speaker. After the show, we talked, but not for long. He was really pissed off at you for some reason Brad. I would actually call it; too pissed off. Yeah, RCV is really hard to understand. I want to vote for a third party candidate. I don't want that to elect the candidate I disagree with most. My first choice is the third party candidate, my second choice is the major party candidate that I don't hate the most. I had to get a Ph.D to be able to process that mentally. Actually, I didn't. Had Florida had RCV in place in 2000, does anyone here believe that Bush would have won Florida? I'm a Republican so I was happy to see Gore lose. RCV would have put him in the White House. The person who said that I was angry with Brad oh those many years ago is incorrect. He does great work. He's just wrong on this issue. By the way, when are you Democrats going to get rid of those infernal superdelegates in your system. Good grief!